There are some performance improvements that require physical storage options to be set on tables or indexes. One particular technique that I will take as an example for this article is index compression. 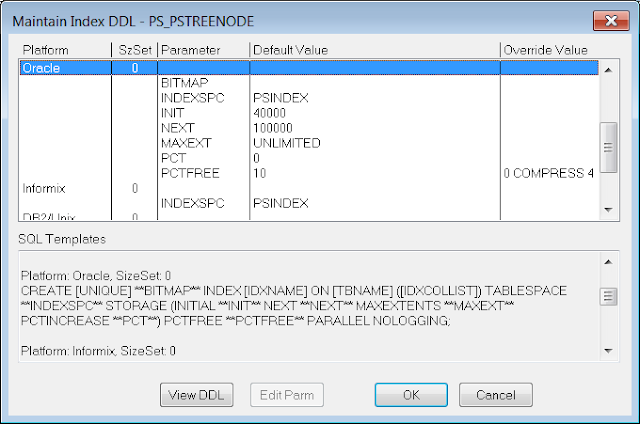 A good example in PeopleSoft is the tree node table, PSTREENODE. It drives many security and hierarchical queries. It is not updated very frequently, only as new trees are brought on. Many of the indexes are good candidates for compression. I have written script to make it slightly easier, calc_opt_comp.sql. This is the output on my demo database, but I get similar results on production systems. 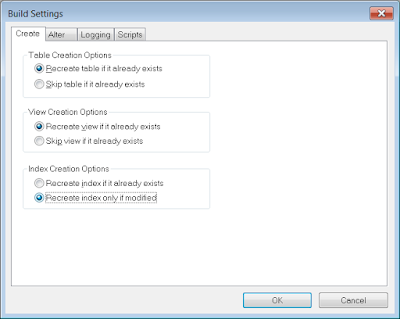 However, I want to make sure that should the table need to rebuilt in the future, PeopleTools will generate the DDL with the appropriate settings. The same principle would also apply to any other physical storage option. I would always recommend that the compression prefix lengths be incorporated into the PeopleTools DDL override in Application Designer (figure 1). While you could extend the DDL model and add another override for compression, I just append it to the PCTFREE setting. So, if the build settings (figure 2) are 'recreate index only if modified', which is the default, Application Designer will not generate a DDL script, nor execute any DDL. 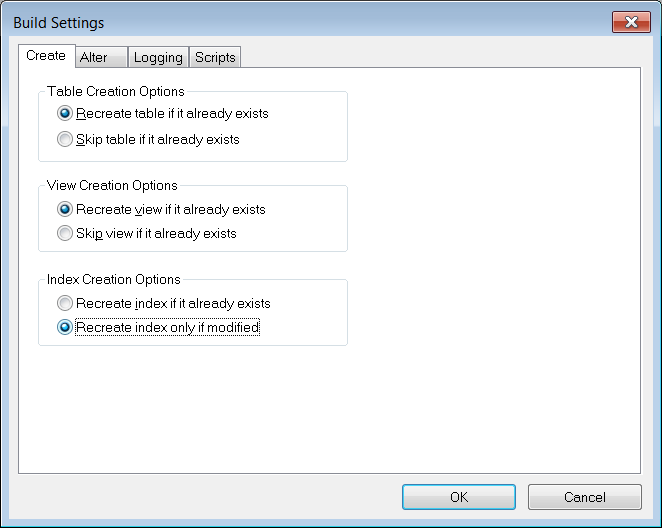 The workaround has always been to set the index creation option in the build settings to 'recreate index if it already exists'. However, we then discover the override doesn't appear in the DDL. As Application Designer has not detected a difference between PeopleTools and the database, it has instead used the Oracle DBMS_METADATA package to generate the storage clause from from the index that exists in the database. Hence the DDL contains additional keywords not in the PeopleSoft DDL model. I have only checked this behaviour on PeopleTools 8.54, but use of DBMS_METADATA was introduced in PeopleTools 8.51, so this problem has probably existed since then. CREATE UNIQUE INDEX "SYSADM". "PS_PSTREENODE" ON "SYSADM". "PSTREENODE" ("SETID"
PeopleTools generates the create index with the compression specified in the PeopleTools table. Rather than go through the business of dropping the index so you can then generate the correct script to then recreate the index, I would suggest just implementing the change manually by rebuilding the indexes. This makes the business of implementing physical attributes through Application Designer much more complicated. I would still recommend recording the settings in Application Designer, if only because it provides documentation, but then it may be easier to implement the changes manually.